Heads up! This tutorial is for the Qwiic Open Log for I2C [ DEV-15164 ]. If you are using the OpenLog for serial UART [ DEV-13712 ], please refer to the OpenLog Hookup Guide. 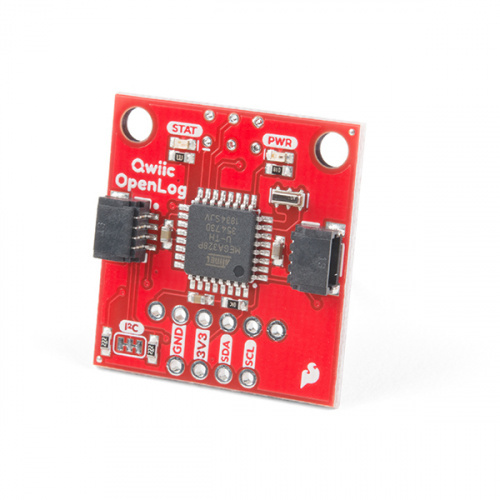 The SparkFun Qwiic OpenLog is the smarter and better looking cousin to the extremely popular OpenLog. We’ve ported the original serial based interface to I2C. Now you can daisy chain multiple I2C devices and log them all without taking up your serial port. Pop in a microSD card, write some simple code, and your data will be recorded to a text file on the microSD card. In order to fully work through this tutorial, you will need the following parts. You may not need everything though, depending on what you have. Add it to your cart, read through the guide, and adjust the cart as necessary. If you are not familiar or comfortable with the following concepts, we recommend reading through these before continuing on with the Qwiic OpenLog Hookup Guide.